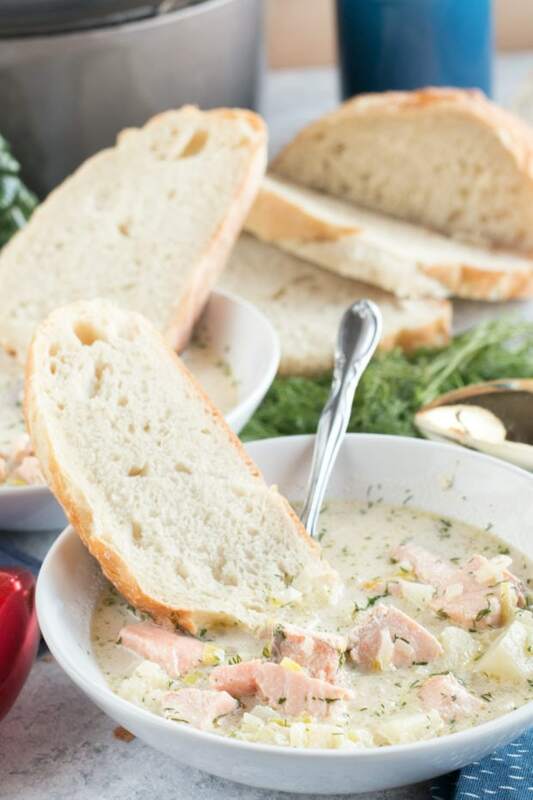 Salmon Chowder is a recipe that is near and dear to my heart. 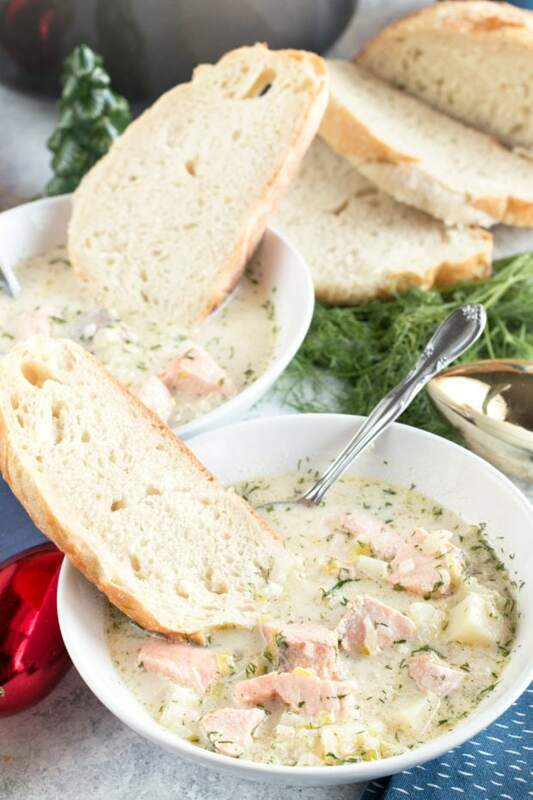 The creamy chowder base, the hearty salmon and potatoes and the fresh hint of dill are flavors that I look forward to every Christmas Eve. This is my take on my grandmother’s favorite recipe, and I hope it becomes a family tradition of your own this year! Disclosure: This post is sponsored by Le Creuset! As always, all opinions and recipe are my own. Thanks for supporting the brands that support Cake ‘n Knife! Sitting down to write this post, particularly at Christmastime is surprisingly a little harder than I imagined it would be. As some of you may know from my About Me, my grandmother was my family’s own Julia Child. She was a masterful cook who was passionate about making the best food for friends and family any day of the year. Of course, Christmas was (and still is) my favorite time of year, so it’s the recipes from the holiday that have a permanent place in my memory as December 25th draws closer and closer. 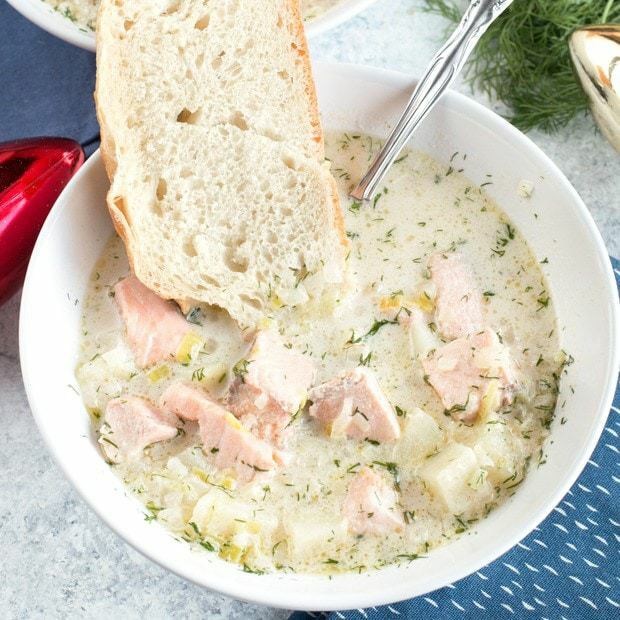 Salmon chowder is what officially marks the start of Christmas for us as a family. 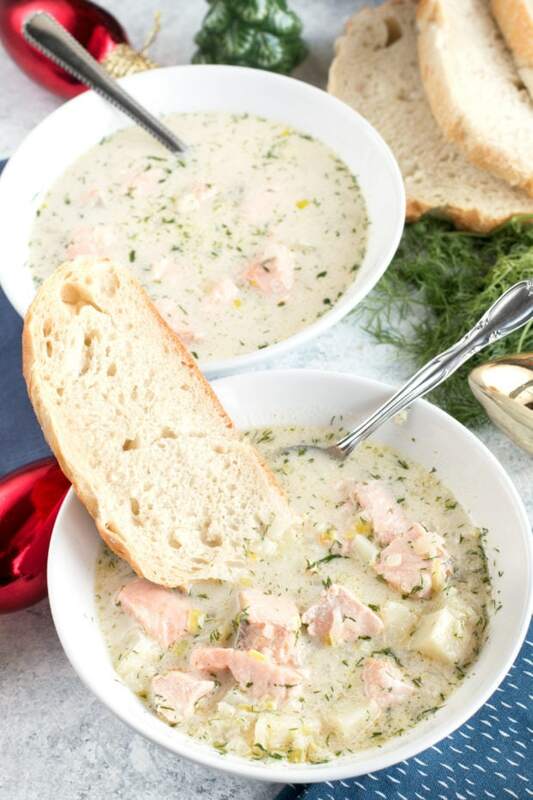 Every Christmas Eve, my grandmother would serve up fish chowder. Some years it was a white fish, but I remember the first time she served a salmon chowder and OMG everyone lost their MINDS over it. Since then, it’s been the family’s favorite so for our big Christmas Eve gathering every year, that’s exactly what we serve. A handful of years ago, I cooked my grandmother’s classic recipe for the first time for the family (with a few little changes of my own, of course), and ever since then, I’ve been asked time and time again to make it. I don’t know if it’s the magic of my grandmother’s original recipe, the magic of Christmas or the magic of working with my grandmother’s original Le Creuset stock pot that makes it come out so perfectly, but somehow it does. My grandmother LOVED using Le Creuset. I remember her bringing out the skillets and dutch ovens, the big blue stockpot I use today and the various kitchen tools with the famed “Le Creuset” logo adorning them. She always told me Le Creuset was the best you could buy for your kitchen, and once I started actively cooking at home, I discovered exactly why. Not only does this company have incredible colors and design to bring your kitchen to life, they have the quality that cooks dream of. I mean, take my grandmother’s giant stock pot. I don’t even know how many years she had it before I was gifted it about 8 years ago, but it still is just like new. That’s exactly why I will always ALWAYS stick with Le Creuset for the rest of my life. It’s not just about quality and design, it’s also about having something that I can cook in now and also with my family years from now. It’s about handing down that tradition, just like my grandmother handed down her recipes to the entire family. 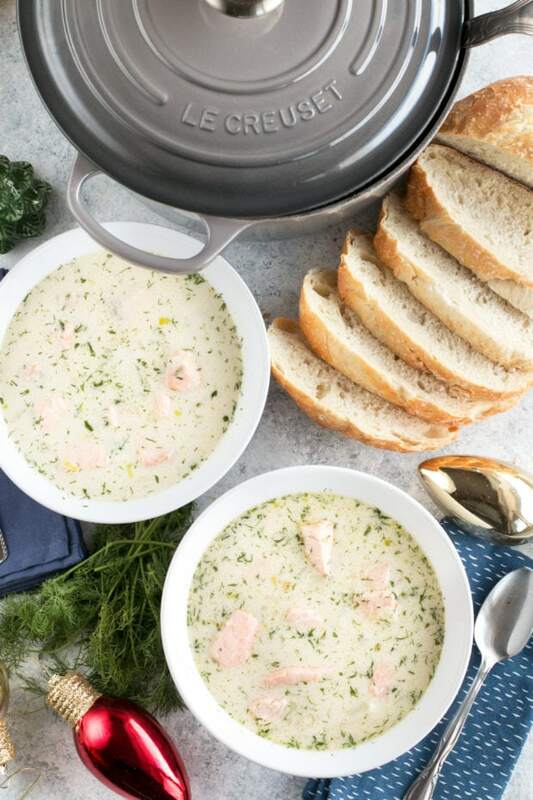 Le Creuset is tradition in my family, and that’s exactly why I wanted to partner with them for this chowder recipe. 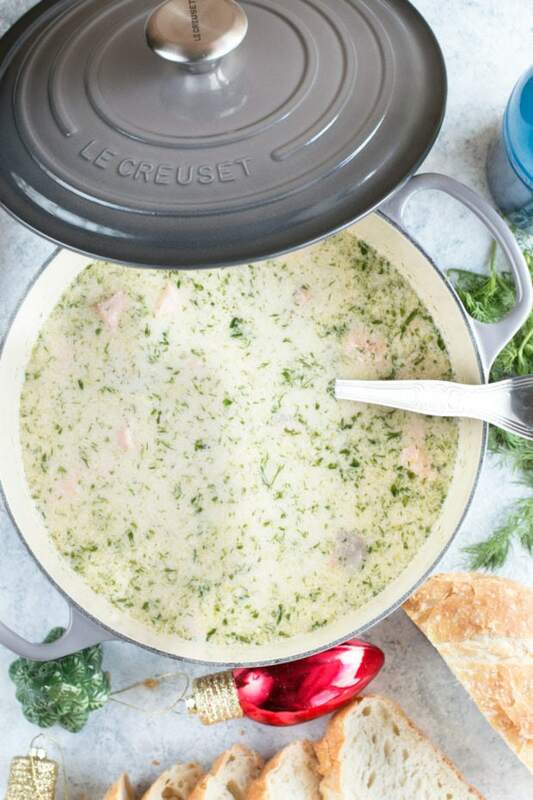 The chowder itself, while being hearty, is also light and fresh with a burst of fresh dill in every spoonful. My adaptation of the recipe include a little extra fennel for a bite and a dash of cayenne pepper for just the right amount of heat. Pair it with some crusty bread (or oyster crackers!) and you have a dinner that is truly rich and memorable. I’ll be serving this soup up on Christmas Eve with plenty of both, plus Christmas Sangria, salad, and a hefty meat and cheese platter to kick off cocktail hour before dinner. I can’t believe I am saying this, but it is the FINAL WEEK of the 12 Days of Jolly Giveaways!! Thank you so much to all of you who have been keeping up with the posts all month long and entering to win. This is honestly my biggest giveaway EVERRRRR. Thanks to Le Creuset (the primary sponsor of my 12 Days of Jolly Giveaways), we have come together to give one lucky ready a Le Creuset 5-Piece Signature Set that includes a 5 1/2 qt. round Dutch oven, 1 3/4 qt. Signature saucepan, AND 9″ Signature skillet! It’s just the right set you need to hit all your cooking goals in 2018. Just head below the recipe and enter the giveaway for a chance to win! Don’t forget to check out the other holiday recipes I’ve shared for the 12 Days of Jolly Giveaways (Day 9’s giveaway is still open!)! 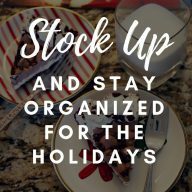 Grab everything you need (and everything you see in this post!) 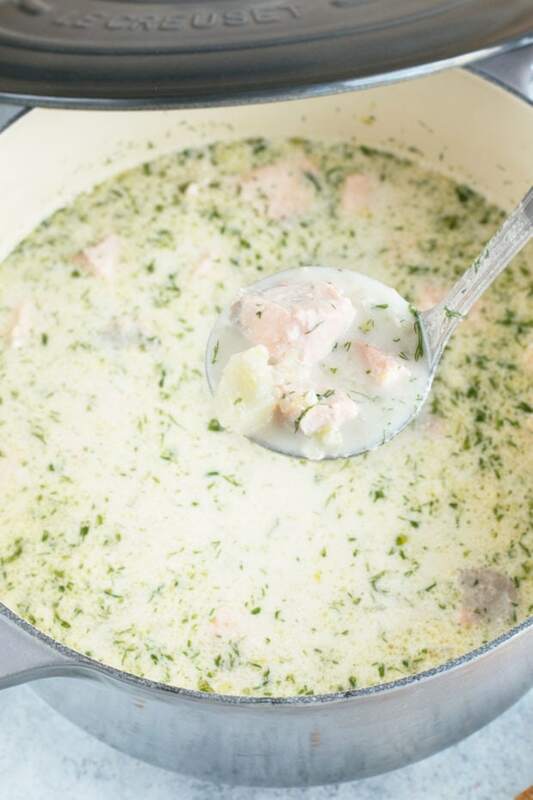 to make this chowder! 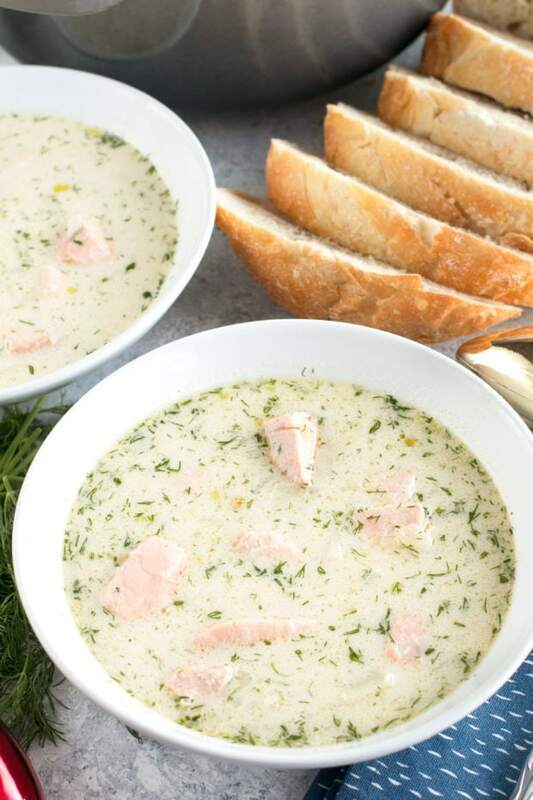 Pin this Salmon Chowder recipe for later! This is my take on the tried and true salmon chowder recipe my grandmother served up all my life for Christmas Eve. It's creamy yet light, savory with a slight heat at the end of every spoonful - perfect for any gathering! In a large Dutch oven over medium-high heat, melt butter. Add onion, leek and fennel, cooking until softened, approximately 5 to 8 minutes, stirring occasionally. Add fish stock and potatoes. Season with salt and pepper, then bring the mixture to a boil. Reduce heat and simmer until the potatoes are tender, approximately 20 minutes. Add the salmon and simmer until just cooked, approximately 3 to 5 minutes. Stir in milk, cream, dill, garlic powder, and cayenne pepper. Cook until warmed through but don't bring the mixture to a boil. Taste and adjust salt and pepper as desired. Serve warm with crusty bread and white wine. 1. Enter the giveaway through the Rafflecopter widget below. Everyone gets a free entry! You can enter multiple times by following and sharing on social media. (If you’ve followed in the past, that counts! Just enter the information as prompted.) All entries will be verified. No purchase is necessary to win. 2. The giveaway is open until Saturday, December 23rd at 11:59 p.m. CST. One winner will be chosen at random and e-mailed within 48 hours. Winners must claim prize within 48 hours of initial contact. The retail value of the prize is $660. Prizes listed above are the only ones available. 3. Open to U.S. residents over the age of 21 years old with a valid shipping address only. My favorite holiday cooking memory is helping my mom make secret recipe stuffing. Its a French-Canadian pork stuffing that my grandparents made for Christmas eve dinner. We call it secret recipe stuffing because know one knew the recipe…. Not even my grandparents. My grandma would start it and then my grandpa would sneak into the kitchen and add spices. Plus it was slightly different each time. So after my grandfather past I remember helping my mom recreate the recipe. After lots of tasting and tweaking… We got it!!! My family has a feast of the 12 fishes dinner for Christmas eve every year. 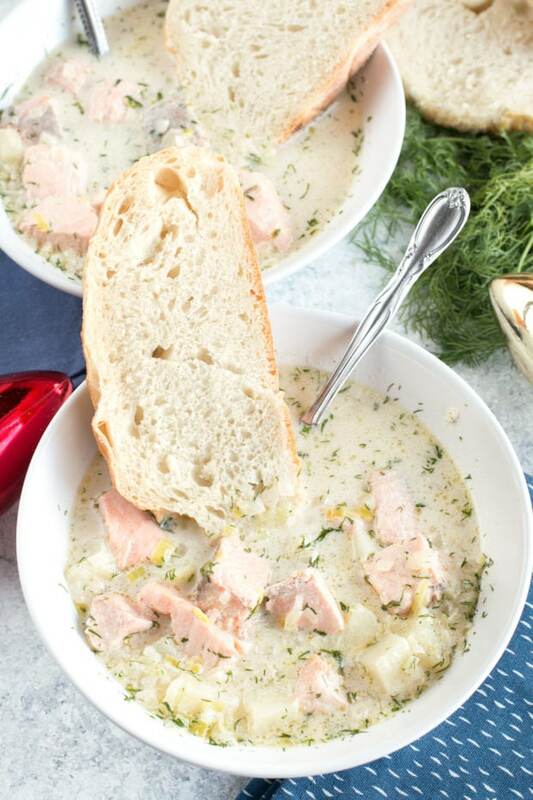 Your salmon chowder would be a great addition to this meal. Besides soup, we have shrimp, baked fish and seafood pasta. My favorite memory is enjoying this meal with my family and then opening gifts. We decide on a Christmas menu and then draw out of a hat to decide who makes each dish for dinner! My family when I was younger always came together for soup on Christmas Eve and then traditional Czech menu on Christmas day. Then come New Year’s Eve which was my father’s birthday, we’d go to teh local team’s hockey game, then come home and have a living room appetizer picnic to watch the ball drop on television. As us kids have grown up we have tried to keep at least part of this tradition alive. We still do soup on Christmas Eve. Our Christmas Day menu changes from time to time now as I developed a pork allergy and can no longer eat the traditional pork roast we did. But on New Year’s we still make our way back and go to the hockey game with my mom to remember my father (whom we lost 11 years ago right before christmas) and after the hockey game we toast him as we have the appetizer spread he always loved. My grandmother once helped me (21 years ago) to make a sweet potato pie for my now husband. Later I found out that he just wanted what we call candied sweet potatoes! The pie was really good and the laugh later was even better! I’ve always made cinnamon rolls for breakfast on Christmas morning for my wife and kids. We usually have a very non-traditional dinner, I make pizza! Something that has always been on the dinner table is my grandmother’s green jello. 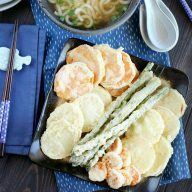 It’s a very simple dish that everybody loves, so I make it in her honor! We don’t currently have any traditions. It’s difficult to have consistency when everyone lives so far away and has other family members they need to see during the holidays. Sad, but true. I guess our only tradition would be that each holiday season is unplanned until the last minute! My grandmother would always make mincemeat cookies. I have used her recipe but it just isn’t the same without her. I always bake tons of holiday cookies (multiple recipes). I’ve been known to bake until 5 am, get a few hours of sleep, and then go to work. Of course, this only works when I’m not on deadline, but it has happened more than once. Usually I knock off the baking at a sane hour! Needless to say, my office mates don’t mind one bit when I show up with the goods…. My favorite memory is waking up early to make a warm apple pie! For holiday meals, my grandmother always use to make this recipe that included cottage cheese, crushed pineapple, lime jello and cool whip. Its not my favorite thing in the world but I feel compelled to make it every holiday now as well. My family makes fried rice every Christmas using my grandmother’s recipe. We don’t have any other traditions aside from that. I don’t have current cooking traditions, but I’d like to start one for baking holiday desserts/cookies! My son and I like to make cookies together but we like to sample the batter a little too much! We don’t do any cooking traditions but I started last year a tablecloth that everyone signs each year, then I go over each pen in short stitch. I’m hoping that it will last a long time and start some interesting conversations many years from now about who was with us each Christmas. We always love making cream cheese and jelly cookies at my parents’ house each year – my sister and I always loved them because the dough does not contain eggs so our mom would let us eat some as we made the cookies! I grew up in a pecan orchard in the south, and every year starting in September when the pecans began falling, my parents would assign each of us, myself and my brothers and sisters, a 4′ tall sack that we were responsible for filling after school and on weekends. We’d let then dry for weeks, and then start shelling ….mama would bag them up and give lots away and use huge amounts of them in our Christmas baking. One of my favorite treats that they were used in was my grandma’s date nut roll, which is to this day a super special treat for me, as she made it only at Christmas and everyone in the family got a huge boxful of it, sliced very thin and loaded with pecans we’d picked. When I was a kid each of us got to decorate our own sugar cookie to leave out for Santa. I think it was my parents way of having an activity associated with Christmas Eve, the same way we decorate eggs on Easter eve. We do the same thing with our kids. We always make sugar cookies pancakes on Christmas morning. When I was young my Mom’s side of the family got together on Christmas Eve and she would make chili as well as chicken and noodles. BEST night!! I miss that. I always have to make my two brothers peanut butter balls, my daddy peanut brittle and my mom granola! After all of these years, these things are always requested! We cook a seafood dish each year on Christmas eve and all of us look forward to that. In recent years we are often joined by friends, as well. I actually don’t have any holiday cooking traditions with my family. I was never allowed in the kitchen. Haha! I bake homemade pies each year which I learned from my mother and grandmother. I don’t know if twice in twenty years counts as a tradition, but once my mother made my brother a Beef Wellington on Christmas. He talked about how wonderful it was for a decade. So, in the tiny East Village New York apartment that I once had I made it for him again in an oven that might have originally been designed for a doll house it was so small. It was extremely hard to accomplish, but he was suitably thrilled. My family bakes spritz cookies every year along with pecan buns! And then we pretty much go the traditional ham dinner route for the main feast! My husband’s family always heads out for a Chinese Christmas dinner! Haha, I love it! I never had any baking traditions growing up, but now that I am married on Christmas Eve my husband’s family makes 7 types of fish and I always enjoy helping them cook! Making figgy pudding (steamed) with hard sauce for Christmas dessert. Tradition of baking and cooking lots of good foods. We always recreate my grandmother’s recipes too. My favorite is her classic stuffing recipe. It wouldn’t be the holidays without it. We bake lots of cookies that we have been making since I was a kid. I loved baking with my grandma. I remember baking cookies with my mom. Every year mu husband and I bake rum cakes for family and friends and deliver them together. We always make Christmas treats for family and friends. Yesterday we made cranberry, apricot and almond bark. 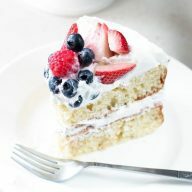 It’s a new recipe and so good! In our family, we host a full thanksgiving feast around the holidays. Since we’re not usually together for turkey day, we always do it around Christmas! This sounds so yummy! I’ve had my eye on a Le Creuset Dutch oven for awhile now. My family’s tradition for the holidays is baking and decorating cookies together! My mother, daughter and me always prepare Christmas dinner while laughing and sharing memories. PRICELESS! For the past 30 years I’ve spent a weekend after Thanksgiving with my sister and her mother-in-law (who was my babysitter during elementary school) to make tamales. Its a day full of fun, food and family. My family gets together and makes delicious sugar cookies! Always great memories! We always make red velvet cake and bbq ham for Christmas. I have no idea were the tradition came from, but I happily continue it! I love baking with my mom. We make traditional recipes from my country and the memories it creates is wonderful. We always make chili and cinnamon rolls on Christmas eve. I bake cookies with the grandchildren and have had some pretty funny experiences with what has gone into the dough when they were younger. Literally, cars, snacks, sneezes, etc. My grandma would do all of the baking and cooking before we got to her house, except for the fudge, which she saved till the end so I could help. She taught me to make the BEST fudge.